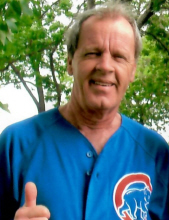 Douglas Wayne Owens, 62, of West Frankfort passed away Thursday April 11, 2019 in Herrin Hospital at 11:27 am. Douglas was born March 3, 1957 in Benton to Glenn and Kendra (Meacham) Owens. He is survived by his father Glenn; son Josh (Julie) Owens; daughter Kim Owens; five grandchildren Kiersten, Trinity, Brenya, Jaycee, and Remy; brother Rick Owens; three sisters Anna (Jack) Tierney, Jane (Marty) Williams, and Tedi Mikutis. To send flowers or a remembrance gift to the family of Douglas Wayne Owens, please visit our Tribute Store. "Email Address" would like to share the life celebration of Douglas Wayne Owens. Click on the "link" to go to share a favorite memory or leave a condolence message for the family.